When the kids come running in the door after school and they are starving to death having a quick snack ready for them is a must!! This gluten free pizza is not only easy but tastes fabulous too. You can have it ready to go in under 15 minutes and can turn it into a cool after school kids activity and let them make one themselves! Start by placing your gluten free tortillas on your baking pan. Place a tablespoon of pizza sauce onto the tortilla and spread it around as close to the edge as you can get. Sprinkle cheese onto the top and add on any toppings that you wish to use. Do you have any gluten free pizza recipes that are as easy as this? I have to admit, I’m a little jealous of your kids! I would have loved to come home from school to find a delicious pizza waiting for me. This looks so good! Thank you for linking at the In and Out of the Kitchen Link Party. Hope to see you again next week. Ah…..pizza on the tortilla! Great idea for a quick and dirty treat. Love it. 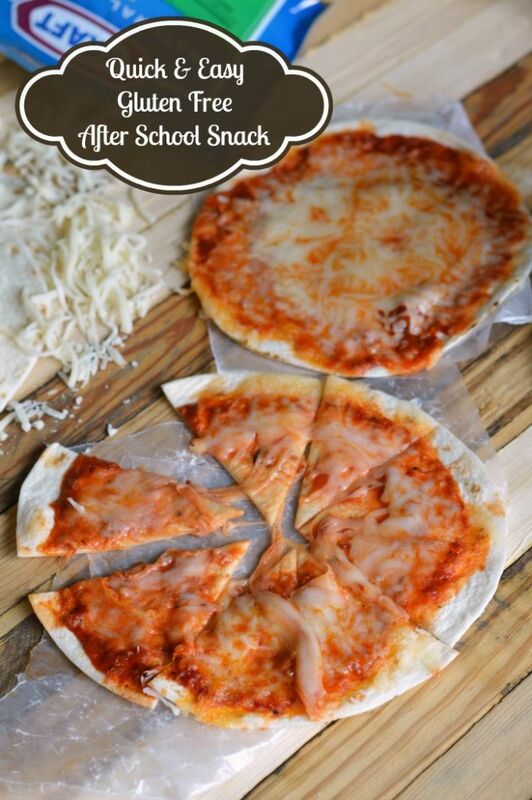 Great pizza idea thanks Bekki for sharing at Foodie Friends Friday! G’day and thanks for stopping by and sharing your link at our #SayGdayParty! Reminds me of childhood pizza yum! Looks delish! Thanks for sharing at our link party!